Review: BBQ Grill Mats by:Grape Stuff | A Simple Life,really?! Nonstick/made from heavy duty PTFE (PFOA Free) coated fabric. Shredded chicken breasts are a thing of the past! When the party’s over, clean up’s a breeze! Just wash in warm soapy water or put in the dishwasher & you’re ready for your next grilling adventure! Great for all types of food; Chicken, ribs, fish, veggies, steaks, burgers, kabobs, shrimp & seafood, bacon, grilled cheese, pizza, even eggs! 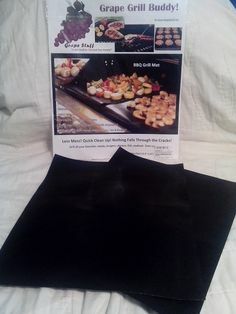 Can be used as a cookie sheet liner too! It is finally summer and in the Patterson household we use the summer to declare it a grilling summer. My husband takes it upon himself to grill up tons of meat on our grill so that I can take a break many times during the season. We try to grill a variety of different meats so that we won’t get stuck in a rut and it works out just fine for me. a great way to start these hot months off right! As the ultimate start to grill season approaches my sweet husband starts looking at his grill and buying new things for his grill.. He looks into products he would like to try and one of the products that we have been so interested in but were afraid to purchase was a grill mat. So when I had the chance to review these for you I jumped at the chance because I thought these are really great products and I know my readers would like me to tell them all about it. So the 4th of July was the day we decided to give it a go on our charcoal grill. 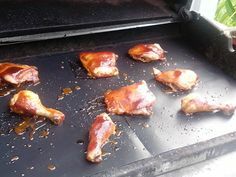 What better way to try them but with BBQ chicken, to us the messiest and hardest item to grill. Upon opening the package you realize that they are made out of something different than I expected. I expected rubber of some sort but they aren’t made out of that all. They are made out of a heavy duty PTFE coated fabric which is completely non stick and safe for charcoal as well as gas grilling. I thought this is never going to work, but much to my amazement it did. It actually worked perfectly! 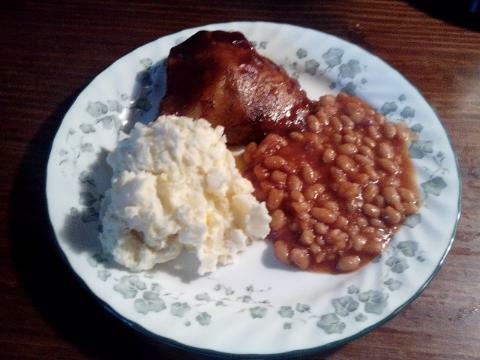 We get nice even cooking and best of all it did NOT stick. Clean up is a breeze too or so my children informed me, they are the official dishwashers in our home. We folded them up and put them away until next weeks grilling time. But after surveying the package, I found out they are oven safe. So it looks like some cookies are soon on the horizon. If you think you may be in the market for some of these grill mats that come two to a pack you can visit this link to learn more. **Disclosure** This product was sent to me at a discounted rate for my honest review from the seller.